“Suddenly” was featured in the “Scandalous Vandals” Exhibit at “Coalesce Studios” in Sullivan, Il. 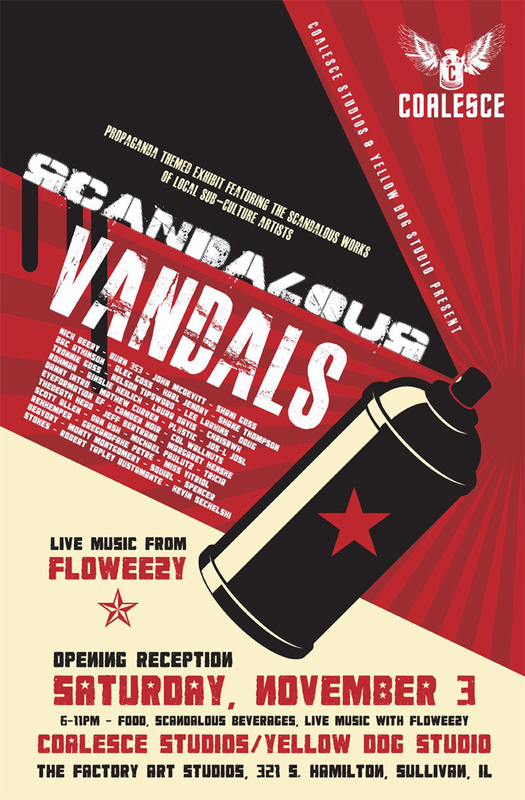 “Scandalous Vandals” is a propaganda themed exhibit that makes a statement about society, politics, governmental control or just anything you as an artist want to make a statement about. This group show explores the theme of Propaganda and allows artists to work in any medium of their choice to produce works that reflect their thoughts on society. Opening party November 3, 2012 from 6-10 pm but usually runs later. There will be food, music, libations, and a very eclectic crowd! Where: Coalesce Studios | The Factory Art Studios – 321 S Hamilton St, Sullivan, IL.